The new Toyota Supra looks fantastic in person as it is, but there were just two things that seemed a little off about it to me. One was obviously its power output, and the other one I couldn’t quite put my finger on—until now. Mmm, yeah. That’s the good stuff. I also dig the taillight change with the circles in Roman’s render, which helps bridge the gap between the 1996 and 2019 Supras a little better than the actual new design. While we’re complaining about things the new Supra lacks, the more we talk about the car in the Jalopnik office, and the more I think about it, the more I can’t help but hope that Toyota hasn’t shown us everything planned for the Supra. For one, if it only ever offers 335 horsepower, it’ll be haunted forever by the shadow of the more powerful America-spec BMW Z4 with which it shares pretty much all of its powertrain and chassis components. It just doesn’t look like a car that should be smoked by a homely little German convertible. 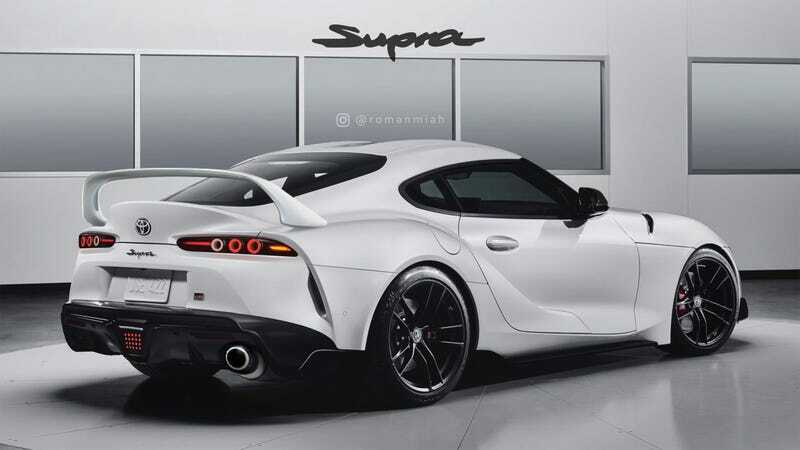 Of course, it likely won’t take long for new Supra buyers to fabricate and install their own homage wings, and do their own tunes, and maybe paint it orange and throw a nice neon green sticker package. Oh, and if Toyota wants to T-top it again, don’t let me stop them. Make sure you check out Roman’s Instagram and Facebook. Update, 8:30 p.m.: The article was updated with images sent to Jalopnik by Roman Miah. Thanks, Roman!